"Most normal people are weirded out by my necro powers. Necros are all over the place, you know? But there’s only a handful who attend my high school, and most of them are too dark and angsty for my taste. Plus, I don’t look good with Kohl on my eyes and my nose is too cute to be pierced." "Not feeding a zombie isn’t like not feeding your cat. He. Will. Eat. You. And your cat. People who forget to pick a case of Ghoul-AID sometimes don’t live to regret it." "You will be afraid. That fear will sit like a cold, dark lump in your stomach, and it will grow tentacles and clutch at your heart and your brain, and choke your thoughts and emotions until all that it exists is pain and exhaustion and terror. My advice? Embrace it." "I looked him over, head to toe. His chocolate-brown locks brushed his shoulders. His face was angular, his lips a slash of angry red. His T-shirt, jeans and sneakers were all black. Usually, one-themed looks totally didn’t work, but for him … yeah. Black was the new hot." "Something in Rath’s eyes had changed—going from glittering fury to … well, I wasn’t sure. It was still a dark emotion, tormented almost. The tension thrumming between us shifted. It was still physical, just more intense. And confusing. 'You really are beautiful,' he murmured. He leaned forward, his gaze on mine, his lips dipping close to my ear. 'But you’re still a brat.'" 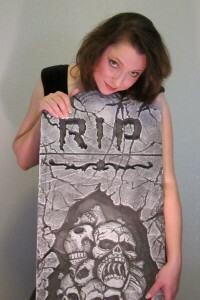 Michele Vail writes young adult paranormal fiction about zombies and reapers. She likes reading, dogs, cats, board games, ghost-hunting shows, and Halloween. She believes in magic, in the impossible, and in the restorative powers of chocolate. Michele lives happily-ever-after with her Viking and their family. I brought him back to life. Molly Bartolucci wants to blend in, date hottie Rick and keep her zombie-raising abilities on the down-low. Then the god Anubis chooses her to become a reaper—and she accidentally undoes the work of another reaper, Rath. Within days, she's shipped off to the Nekyia Academy, an elite boarding school that trains the best necromancers in the world. And her personal reaping tutor? Rath. Enter for a chance to win a copy of Undeadly by Michele Vail! (US/Canada only.) 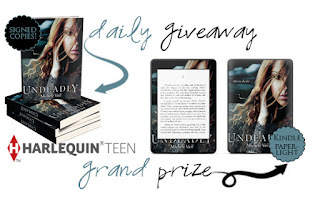 One reader from across the blog tour will also win a Kindle Paperwhite in an Undeadly skin. Remember to check out the links below and visit the other tour stops to gain extra entries! Thank you so much for being part of the tour. This sounds really good. Thank you for the sneak peak into this book. Sounds wonderful. Great quotes! I'm really intrigued by this book. Thanks! Looks good! Can't wait to read it...or win it! I can't wait to read Undeadly. I have been looking forward to it. Nice quotes. Thanks for the giveaway. I've been lusting after this book for ages. I can't wait to read it! Is the book out yet? I'm getting impatience waiting. Thanks for the giveaway. LOL, funny quotes! I especially love the second one! Thanks for participating in this awesome tour! I can't wait to see what happens to her boyfriend when she brings him back from the dead!!! I am keeping my fingers crossed for this win thanks for sharing this awesome giveaway. Thanks for the chance to win! 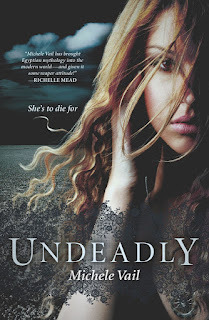 I'm so excited for Undeadly.